Catch up with fashion’s finest from Notcouture. To find out more about each piece, click on its individual image. Presented to you by Nivea for Men. Look like you give a damn! When prompted with the challenge from Nivea for Men to let them sponsor a series of posts on “Men Who Look Like They Give A Damn” ~ i couldn’t resist. After all, who can resist a man who looks like they give a damn, right? Well, actually i think the perfect combo is more the man that can NOT look like they give a damn, while still looking better than those who try ~ it’s about effortless execution, no? 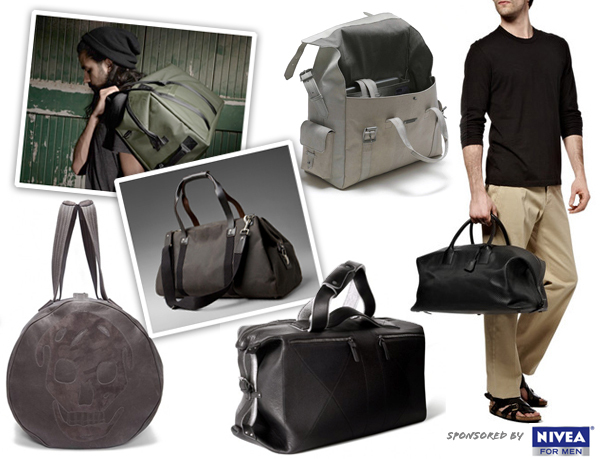 SO anyhow ~ lets kick this off with some weekender bags that are perfect enough for men ~ and lustworthy enough for women too! Some of my favorites, that i’ve wanted for some time now, and recent updates… all gorgeous, simple, and highly functional… check out the picks on the next page! Get your fashion fix with a roundup from the ever stylish NotCouture. With crisp linens, sleek garter belts and turbine necklaces, this roundup has a little something for everyone. To find out more about each post, click on its individual image. Lovely details on this new shirt… A modern twist on a timeless classic, the Urbaneering Workshirt from Serum Venom embodies the Street/Spec design the brand strives for, combining tactical functionality with everyday comfort. “Serum Venom set out to investigate how to push the limits of a modern workshirt, without compromising its classic appeal. We focused on combining the attention to detail and strength of military specification garments with the day to day functionality requirements of an urban existence. Our conclusion is a system of design we refer to as Street/Spec, which combines extreme tactical functionality with everyday comfort. 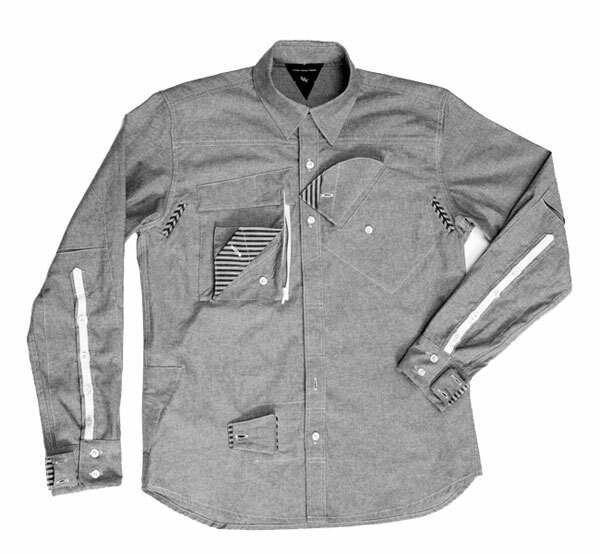 The Urbaneering Shirt has multiple function pockets, reinforced cuffs, lower placket tab closures, heavy duty under arm vents, rear hidden hang strap, reinforced front placket strap loops, authentic vintage metal workwear button, side tension stash pocket and reinforced universal internal seams.” See more details on the next page! The latest package that arrived just made me wish i was a dad. How weird is that? This Macallan 18 year & Shwood Sunglass gift set in a gorgeous wood box just arrived as potential Father’s Day gifting ideas… but i love them both! No offense, to Dads, but these should really go on the gift list for Moms, Grads, friends,… any occasion really! The glasses above are Shwood’s Canby in East Indian Rosewood with grey polarized lenses. 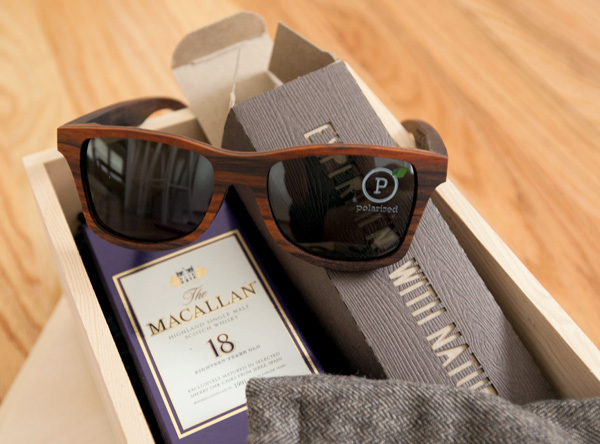 The only thing that would take this gift set further… if only Shwood and Macallan would truly join forces and make a series of sunglasses from actual Macallan casks. Different woods to go with the various scotches… i’d rock the Sherry Oak Cask sunglasses any day! Take a peek at the awesome packaging and details on the next page! I love Helmut Lang. And i couldn’t help but share the ornithological aspect of their Resort 2012 collection when i was checking it out at Style.com. The imagery resembles X-Rays of the birds in flight ~ in a nice stark white on black… other pieces add a subtle touch of black feathers on their simple, architectural dresses. Visually mesmerizing, no idea how they’ll seem in person, but make for interesting pics. See close ups on the next page. P.s. The model freaks me out a little, but when i tried to crop her head out it was even worse. This post is part of a NOTCOT series on inspiring, independent design thinking, brought to you by Saab. At Saab, we believe in independent thinking. It’s in everything we do. Learn more here. A perfect example of “inspiring, independent design thinking” ~ i love the work of Vienna based, Hard Graft ~ and the latest to join the collection is a black version of the now classic 2Unfold. It’s amazing to see how things have grown and evolved since i first posted about their Unfold bag in 2008, back when they were still Working Class Heroes. There’s actually something magically efficient about how much this sleek and manly/neutral bag can handle - ” This multi-use laptop bag has the perfect proportions to be as versatile as possible - you can easily carry your 17” MacBook in the bag as a briefcase, shoulder bag, backpack or fold it into a courier bag and clutch whilst keeping your 13” MacBook safe inside. The 2UNFOLD doesn’t only look good on the outside - every handle, rivet etc. 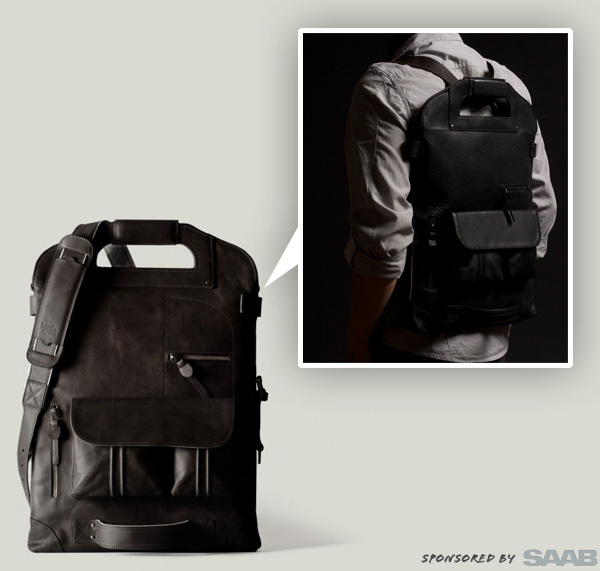 is reinforced and supported on the inside, to ensure this bag carries your busy life with ease and style. The back zipper pocket easily fits your iPad and hard graft case. In the main compartment you’ll find a pocket for your phone and wallet and as well as your MacBook there’s space inside for more, such as your camera, magazines, sweater etc.” Amazing right? Take a peek at the details close up on the next page! A stunning fashion roundup from NotCouture ~ feel free to share your fashion obsessions with us too! Scissor goodness from our friend David Gensler! Gorgeous new series of hand crafted, antique tailoring shear pendants by David Gensler of the KDU and Serum Versus Venum and Osamu Koyama from Complete techniques. The new shears collection reflect David Gensler’s extensive collection of tailoring shears, over 800 pairs that span 450 years! 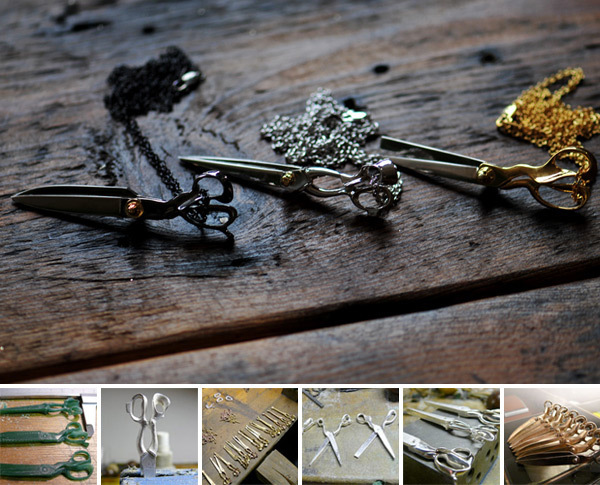 The new series includes three styles which are T. Wilkinson & Sons (English), R. Heinisch (American) and an unmarked Parisian pair, which come in Black Mirror finished over pure silver, silver with 24k Gold bolt, pure 18k gold, rough finished brass, hammered antiqued silver and other combinations to replicated actual traditional shears. They’ll be available next week on the svsv online store! In the meantime, check out more pics of the svsv page for the project here. Ready to see more pics of the final products as well as the making of? To the next page! I have always loved this idea of a mini wearable vase necklace ~ remember the Rockettoro Blossom Pendants from way back in 2006, with the glass vial, perfect for one flower? 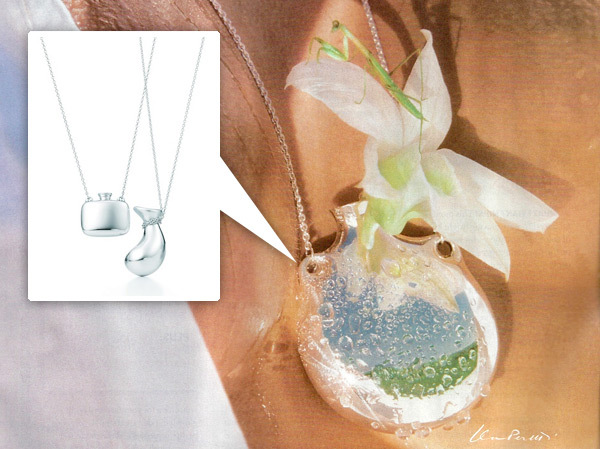 Well flipping through Lucky, i just saw this Tiffany & Co ad for the new Elsa Peretti Bottle Pendants that play on the same concept! “Once i was in Portofino and i met all those beautiful women that were wearing Pucci’s dresses and had a gardenia in their hand. That was the flash that made me think to realize something to keep the flower fresh and alive, therefore the little bottle came to the light…” says Elsa Peretti. So pretty and delicate, it really is a shame they don’t have more images of the pendants with flowers on their site! And i could never see wearing an orchid with praying mantis as i go about my day… but there are so many pretty options! And for those averse to cutting flowers, imaging putting some of that magical hydrogel stuff inside and nursing a seedling around your neck until ready for planting, etc? Take a peek at the other designs and more images on the next page! p.s. I know, Tiffany & Co and Kiel Mead situation is terrible, but these bottle pendants are just interesting objects! The color of the day has inadvertently become: RED! This morning Mercedes dropped off a Mars Red 2011 Mercedes-Benz C63 for me to play with ~ and i happened to need to take a little drive down to South Coast Plaza to go see some Louboutins… (which, as you can see, i clearly gave in to). 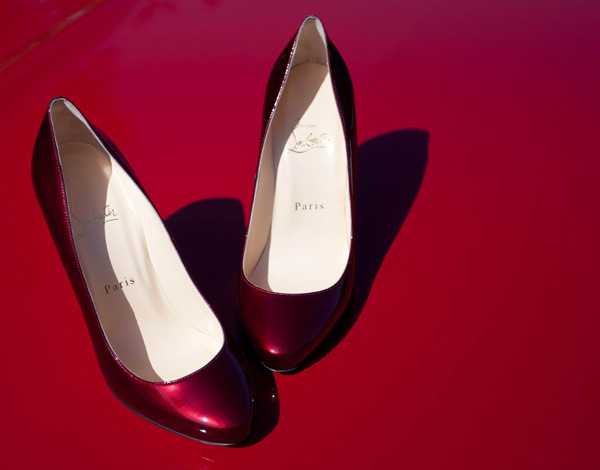 And as i excitedly unboxed them in the car, i realized the signature Louboutin red sole matches Mercedes Mars Red far too well. And… i could not resist, but had to shoot the unboxing IN and ON the car! (I’m liking this unboxing on cars thing… remember the Bentley/Toy shoot?) So if you’re ready for some red… take a peek at the unboxing of the Louboutin Elisa 100 Metal Patent in Rouge and the Mars Red C63 on the next page! Lots of fashion fun from NotCouture. To find out more about each post, click on its individual image. On fun surprises while in London ~ Le Pégase d’Hermès Silk Twill Scarf designed by Christian Renonciat! 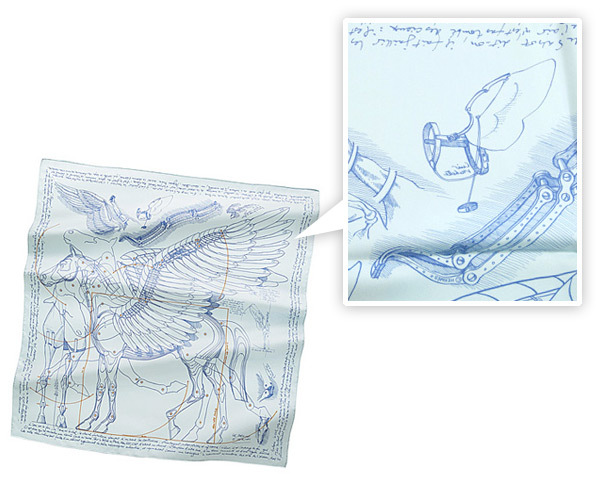 With an architectural/blueprint look and inspirations from Da Vinci (backwards handwriting and all) ~ Hermès gives us a design to build a pegasus and some wings for yourself. Pretty enough to treat like art, i’m currently researching framing options, but until then wanted to share some of the pretty details with you! Unbox/closeups on the next page! 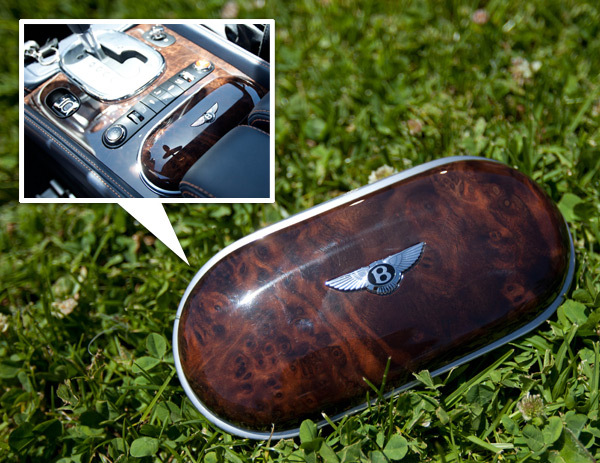 Perhaps the most intriguing (and portable) accessory in the Bentley was the glasses case. I’m hesitant to even call it a sunglass case, since the size definitely didn’t fit most of my sunglasses (and no they aren’t THAT huge!) ~ perhaps its most suited for smaller sun glasses and reading/driving glasses? But it has the same wood that covers the whole dash, complete with Bentley logo of course… and it snaps in perfectly to the cup holder in the center dash. When you raise the arm rests you can even open it in place, or take it with you to go. The interior of the case has matching leather to the seats (in this case Imperial Blue). Anyhow, take a peek at the close ups on the next page ~ as far as dashboards gone mobile, i am strangely drawn to having some of that beautiful woody root ball veneer outside of the car! A roundup of fashion fun from NotCouture. 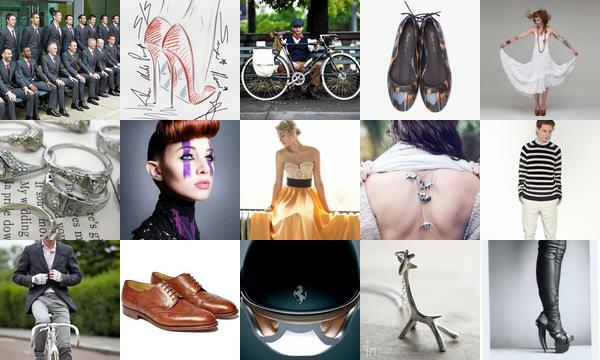 This week’s picks include gorgeous red ballerina flats, porcupine quill necklaces and the anatomy of a classic trench coat. To find out more about each post, click on its individual image.